Since I started taking an interest in modern jazz on vinyl five years ago, a lot of things have sort of clicked into place. Nothing hugely profound, and perhaps all common knowledge to those on a lifelong journey, but it seemed a good time to take stock. I have always been cursed with a desire to understand things, how they come about, how things work, why they are what they are, and not something else. 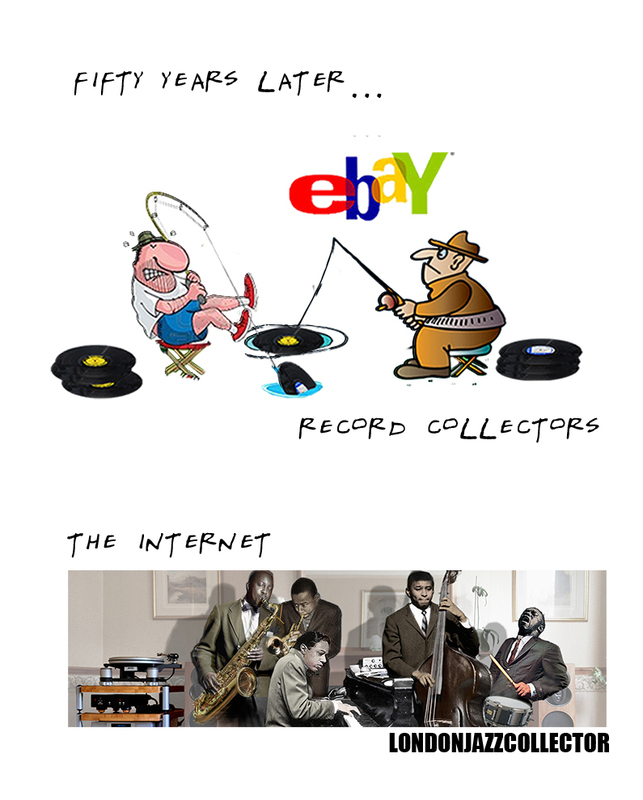 So in simple pictures, the recipe, the basic important ingredients that made record-collecting possible. Leave out any one of them and we would not be here where we are today. I may have missed things out, may be don’t understand other things, but with the wisdom of hindsight, this is what it looks like from where I stand now. 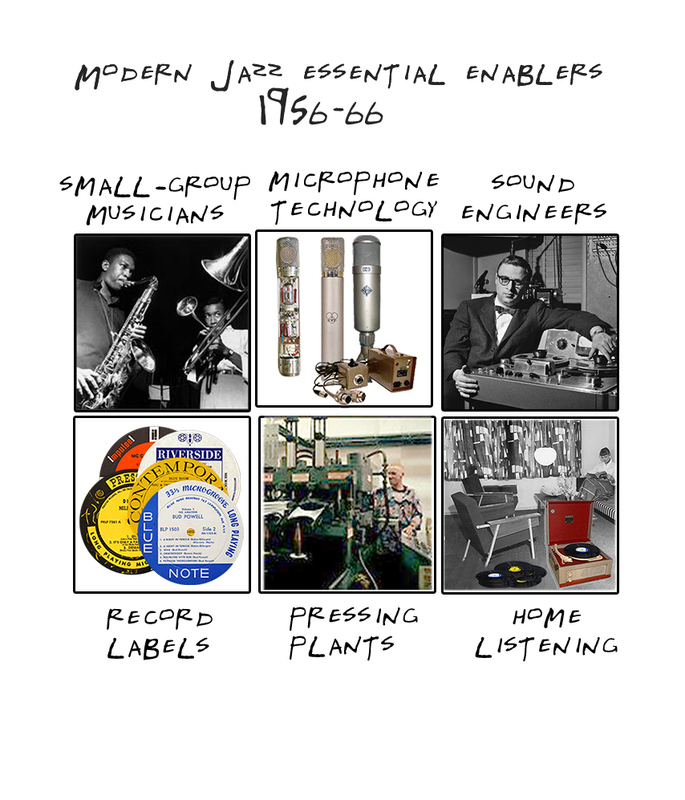 All these things had to happen to create modern jazz on vinyl. The 50’s musicians playing small groups itself is a story, musicians plucked out of large dance bands, work around union restrictions, a free college education for troops returning from military service – musical education, the musical training found in army marching bands (Sergeant Cannonball Adderley, ‘ten..shun! ), radio stations that allowed musicians to hear other musicians, live jazz clubs, and the evolution of music to listen to not just to dance to. And the financing – royalties system and record label contracts that enabled musicians to afford to continue playing. All of this might have happened and today we would be none the wiser, but for recording technology: the new valve-based German Telefunken U47 and AKG C12 microphones replacing puny ribbon mics. Innovation drives improvement in Ampex tape recorders, durable magnetic tape, Scully lathes and record mastering technology And of course the sound engineer heros that deployed the technology – Rudy van Gelder, Roy du Nann, Richard Bock, Tom Dowd, employed by the entrepreneurs that put together the independent record companies and labels to promote and sell recorded jazz: Alfred Lion, Bob Weinstock, Lester Koenig, Orin Keepnews. Not to forget the tiny record divisions of the giant movie companies like Columbia, United Artists and MGM. 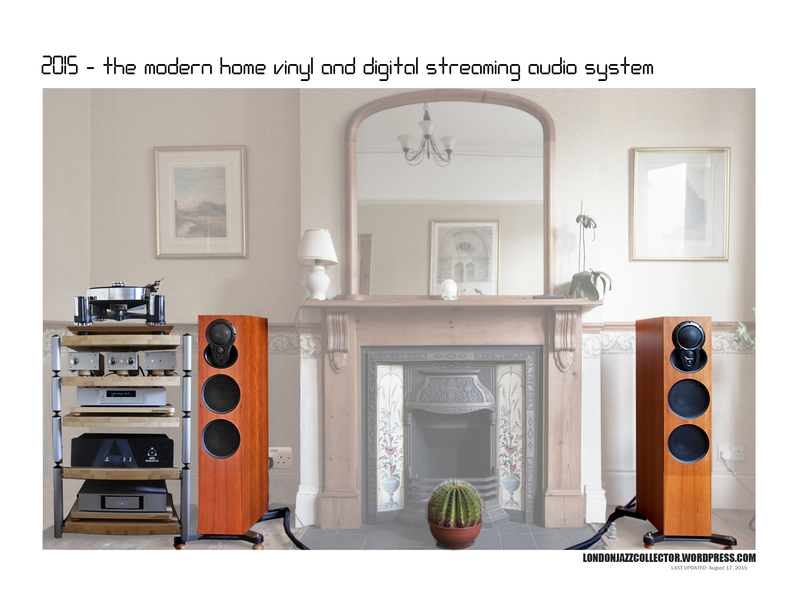 The magical era of record pressing by pressing plants and vinyl pressing machines, the commercial enablers, record shops, facilitate exchange of value – money for records, all feeding the demand for home listening, made possible by home ownership of affordable radiograms and portable record players. The fruit of free market enterprise, whilst the only contribution of Government was to imprison some of the musicians for unremarkable narcotics possession offences, and to look for opportunities to leech on trade through taxes. Not to forget mention the transaction enabling Paypal service, and the world’s struggling postal delivery services, slowed further by tax-collectors holding record movements to ransom. And the essential home vinyl listening sytem, all British precision-engineered components (apart from the Dynavector Japanese cartridge). Todays “time machine” that takes you back to 1956, in its Victorian London home setting (1890-2015). Just to add a bit in the middle, as a collector from my teens in the 1970s. Before the internet, certain shops like Mole at Kings Cross, and big players in the US would have auction lists that you subscribed to. A printed catalogue would be mailed out, we filled in our best offers and waited to hear back. Never won a bloody thing. Most of the big ticket items probably went to Japan. It did mean though that stuff would appear on the shelves of the shop that had initially been creamed off from collections bought, for the lists, and had not been bid on. Even when I lived in Ireland, I would try to arrive in London in the week after the auction list had closed. The other thing was to put wants lists in music magazines. Still the best of the lot though was touring record shops in towns cities and countries that were new to you. I wish I’d taken a pic of all the ones I visited, what a book that would have made. Some nice exotic examples on the UK vibe facebook page. 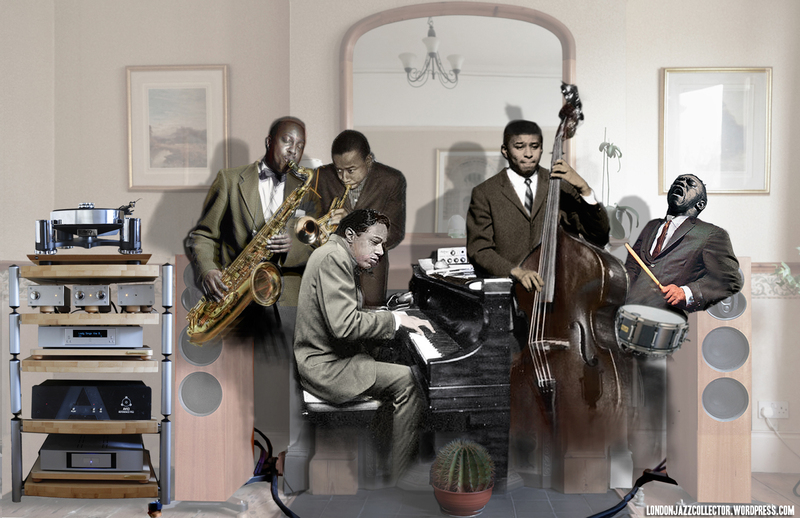 An absolute enjoyable journey of Jazz recording history! Thank you. You said it all. Although there is a generational divide between us: LJC a recent addict, the undersigned addicted since more than 55 years. But, even if, at the time, the information was scarce (I had to sneak in at a newsstand to read the last Down Beat or Metronome, without buying them!) one could find in the shops a huge selection of imported Norgrans, Clefs, Savoys, Prestiges, Blue Notes, Pacific Jazz, Vogues and the occasioal London and Philips. It was all there, behind the counter, no browsing (but charming young ladies would bring in pile after pile), and the retail prices were stiff. Maximum one new album per month for the average student..But the abundance of the small groups, so typical of the fifties, was considered to be absolutely normal. It was never questioned that this would ever change. A better life started when I discovered a seller of complimentary copies at half price. Life became even better when I wrote to Contemporary, Blue Note, Prestige and Savoy. They were willing to sell directly to private individuals in Europe, skipping the sole importers who dominated the scene for too long. That was quite a revolution. Thanks to internet ,and EBay ,we are now living in the best of worlds. The offer of collectibles was never so big. And thanks to i.a. LJC a whole new generation of amateurs is kept informed on the past and present. Bravo!